Shortly after it's premier at The Orange Moon Cafe, we moved the Powder Room to its own blogspot location. You never know what topic may pop up in the Powder Room (sort of like the real Powder Rooms we visit as women!) Topics are usually anything which is currently on my mind. Occasionally there are series of posts, such as A Mother's Heart in War, a series of journal entries when my son was deployed to Iraq. Another was Vacation, journaling our vacation to Boston and New York. 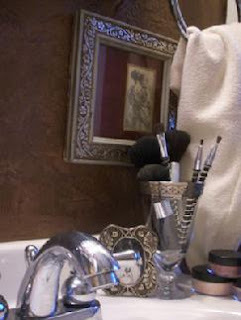 We have taken the entries from a blog we used, beyond the bow, and imported them into the Powder Room. We continue to add entries to this series which all center around our experiences kayaking. The main purpose of the Powder Room is to encourage each other in our walk with the Lord and to glorify Him. We welcome your comments, thoughts and suggestions and appreciate your visits. It is our hope that this site will be a source of inspiration and encouragement to all who visit.